"Wheeler-Dealer" is a fast-paced, action-packed game of skill, strategy, and the "luck of the dice," where two to six players "wheel 'n deal" their way around their own town, buying up, trading & selling local business properties that actually exist. 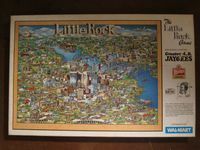 The LITTLE ROCK GAME is being offered as a Community Service by the GREATER LITTLE ROCK JAYCEES. Proceeds from the sale of this exciting game are being donated to the ARKANSAS EASTER SEAL SOCIETY, serving the needs of handicapped children and adults since 1945.